With the season wrapped up, it seems many Arizona athletes were feeling the heat and just wanted to be done. That wasn't the case, for a select few who decided to stick their necks out and try their luck at the Great Southwest Classic in Albuquerque, NM. Aidan Diggs (Millennium, 2018) flew in last minute from a college visit to the University of Montana, for the decathlon competition on Thursday. After five hours of competing, Diggs powered through leg cramps to finish 13th in the 400-meter run. Fortunately, there were only 2 running events on Day 2. Meredith Kiekintveld (Payson, 2019) placed 8th in both the 100m Hurdles and Shot Put on Day 1 and made up some points in the Long Jump and Javelin Throw on Day 2 to finish 10th overall. Arizona Girls racked up some huge points in the throws. On Friday, Arizona had just one girl competing in the Hammer Throw competition. Nanette Collins (Bella Vista Private, 2020) of Scottsdale had made the trek to Albuquerque to take on the Great Southwest. Though her mark was a distant 2nd to the victor, Samantha Kunza of Missouri, Collins' final mark of 130-11 was a lifetime best by over 2 meters. In the Girls Javelin competition Arizona D1 State Champion Keiley Sharp (Kofa, 2019) from Yuma, AZ clinched the victory with her first throw of 150-8.25, over 20 feet ahead of the competition. In the boys' competition, recent Marcos De Niza graduate, Carlan Naisant put everything he had into his plant, though his mark of 200-7.75 only placed him 3rd, just 3 feet behind Tripp Marcus of Louisiana, who took 2nd place. For the Girls' Shot Put, Alexis Jones (Queen Creek, 2018) held the lead from her second throw of 44-0.5 and secured the victory on her last attempt with 44-3.5. Her Arete Throws Nation club teammate, Alaina Diggs (Millennium, 2019) placed 3rd with a mark of 43-4.5 Karsten Santaella (Scottsdale Prep Academy, Sr.) took 2nd in the Discus, while Deshon Toney (Desert Vista, 2018) doubled spectacularly to place 3rd in the Discus and 2nd in the Shot as well. While the Grand Canyon State had various athletes representing in the field and sprinting events there were very few competitors in the distance events. In the Girls 800-meter run of the afternoon session, Rio Rico's Samantha Schadler (2019) finished 2nd with a season best time of 2:17.20 while D4 State Champ McKenna Lane (Scottsdale Prep Academy, 2020) finished 7th in 2:18.99. During the afternoon session, Dominique Mustin finished 3rd in the fast race of the Girls 800 in 2:15.69. 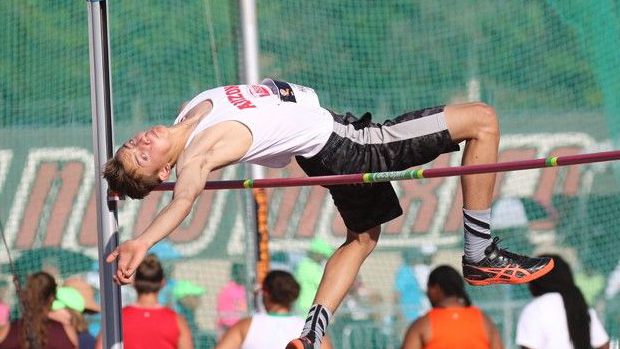 Air Force-bound Snowflake graduate, Jake Hall placed 3rd in the Boys High Jump with a height of 6-8. His Lobo teammates Nathan Kay (2019) and Dylan Kay (2018), finished 7th and 8th respectively with heights of 6-6. State Champion and record holder, Jai Gruenwald (Chandler, 2018) jumped her 3rd performance over 20 feet (20-4.25), to place 3rd while Mia Corners (Gila Ridge, 2019) jumped a new PR of 19-3.5, now ranked AZ #2. Jai also placed 12th in the Triple Jump contest with a new season best mark of 38-7.75. In the Saturday afternoon session, Asiah Fields (Liberty, 2018) took 1st in the Girls 400m dash with a 54.71, her second-best performance of the season. James Kemp (Apollo, 2018) placed 9th in the Boys race with 48.66. On Saturday night, Ta'Mir Waters (Chandler, 2018) won the B field of the 200-meter dash in a new PR of 21-52. His Chandler teammate, Zaire Chest (2018) placed 9th in 24.93 in the Girls' race. The High Hurdles kicked off the afternoon session on Saturday, in which Myreanna Bebe (Queen Creek, 2019) placed 5th in a time of 14.27 for the girls' race and James Smith Jr. (Westwood, 2018) took 3rd in 14.25 in the boys', both earning podium spots. 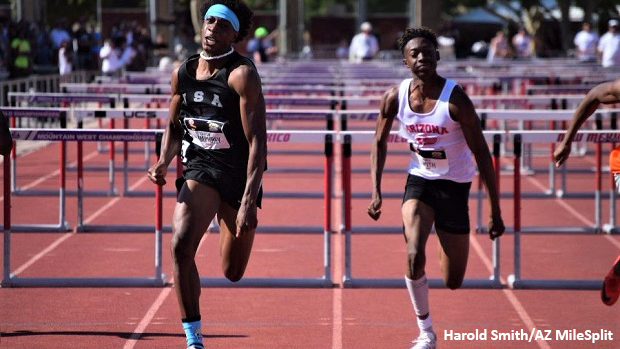 While the wind picked up in the afternoon, it didn't stop Smith's grind to placed 3rd among the Elite Boys in his last 300-meter Hurdles competition with an Arizona #3 All-Time performance of 36.40. Ethan Wright (Desert Vista, 2019) placed 7th in 37.92, while Elisha Brooks (Brophy College Preparatory, 2019) placed 10th in his first intermediate hurdles race since transferring schools. For the Girls 4x100m, North Canyon's Jayde Charlton (2020) and Jadyn Mays (2020) and Chandler's Jai Gruenwald and Zaire Chest (2018) carried the relay to 2nd place in 45.59. That night, Jadyn Mays returned with Anna Foreman, Asiah Fields, and Dominique Mustin for the 4x400m and held on for 3rd place in 3:51.10 to close out Arizona's experience at the Great Southwest Classic.